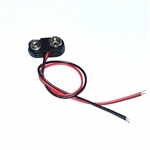 9V battery snap connector with 15cm leads (black & red). Excellent for electronics power supply, prototyping, and laboratory electronics needs. Electrodes are designed to help facilitate electricity experiments. A pair of electrodes are required to demonstrate the flow of electrical current. This electrode is made of iron and is 5-1/2" long and 7/8" wide. Each type holds all standard D cell batteries and comes with 6� red and black pre-stripped leads or Fahnestock clips for easy connection. Made of unbreakable plastic. Holds a single 'AA' battery with two leads (red and black). Electrodes are designed to help facilitate electricity experiments. A pair of electrodes are required to demonstrate the flow of electrical current. This electrode is made of aluminum and is 5-1/2" long and 7/8" wide. Electrodes are designed to help facilitate electricity experiments. A pair of electrodes are required to demonstrate the flow of electrical current. This electrode is made of brass and is 5-1/2" long and 7/8" wide. 12 Pc Set,6 Pcs with Black Sleeves and 6 Pcs with Red Sleeves. Operates on 1.5V or 3.0V DC. Speed: 7000 to 11000 rpm. Motor is 40mm long and 20mm diameter. Shaft size: 2mm diameter and 8mm long. Has two attached leads. Electrodes are designed to help facilitate electricity experiments. A pair of electrodes are required to demonstrate the flow of electrical current. Replacement for the Brownlee Apparatus. Electrodes, Pencil Type, Carbon. 1/4" x 5"
Electrodes are designed to help facilitate electricity experiments. A pair of electrodes are required to demonstrate the flow of electrical current. 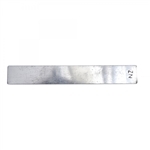 This electrode is made of Zinc and is 5-1/2" long and 7/8" wide.